My blog turns 150 posts old today, and in the spirit of celebration, I thought it might be fun to give a tour of the new classroom that I get to use. Just this week, LBC opened our new Student Learning Commons. God has been so good to us. The staff in the building still looks around amazed, and we still see the final fun details getting added every day. Today the first phases of the reference desk were installed. 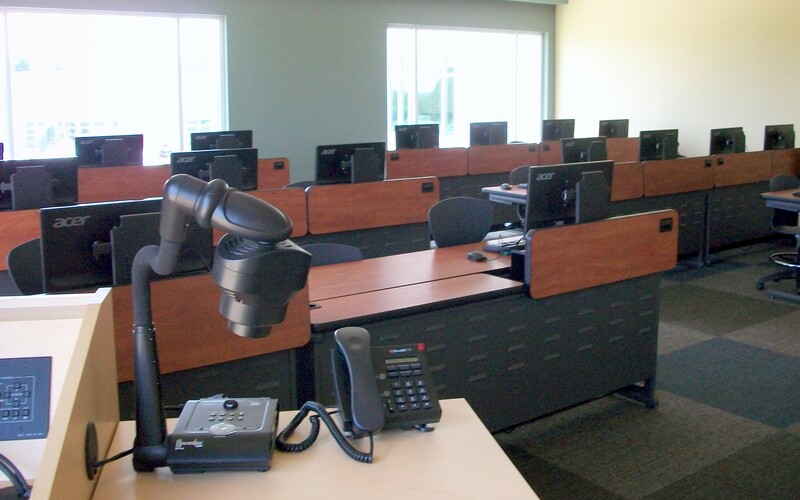 One of the features in the new building is a computer classroom, which was desperately needed on campus, especially as we enter the second year of having a Communication major. Here’s what I get to look at while I’m teaching. Notice the sweet document cam in the foreground that works 100 times better than any document cam I’ve ever used before. And, notice all that beautiful natural light. I think I’ve spend about 50% of my teaching career in interior classrooms without windows, so the fact that nearly two entire walls of this classroom consist of floor to ceiling windows boggles my mind. And, I give two thumbs up for the furniture selection decisions for this room. The monitor, keyboard, and computer mouse can all be pushed below the desk in less than one minute with little effort. No more Facebook policing while I’m teaching! (Well, at least on the PCs. Smart phones may still drive me batty.) And, I like how this setup makes it so easy to toggle between discussion and computer work while we’re in class. I don’t have to settle for seeing the short students’ eyeballs peering over the screens while I’m in the middle of a lecture. And, here is the view over my left shoulder while I teach. The new building is technically built at the geographic center of campus, but campus has been developed from front to back instead of a radiating pattern. 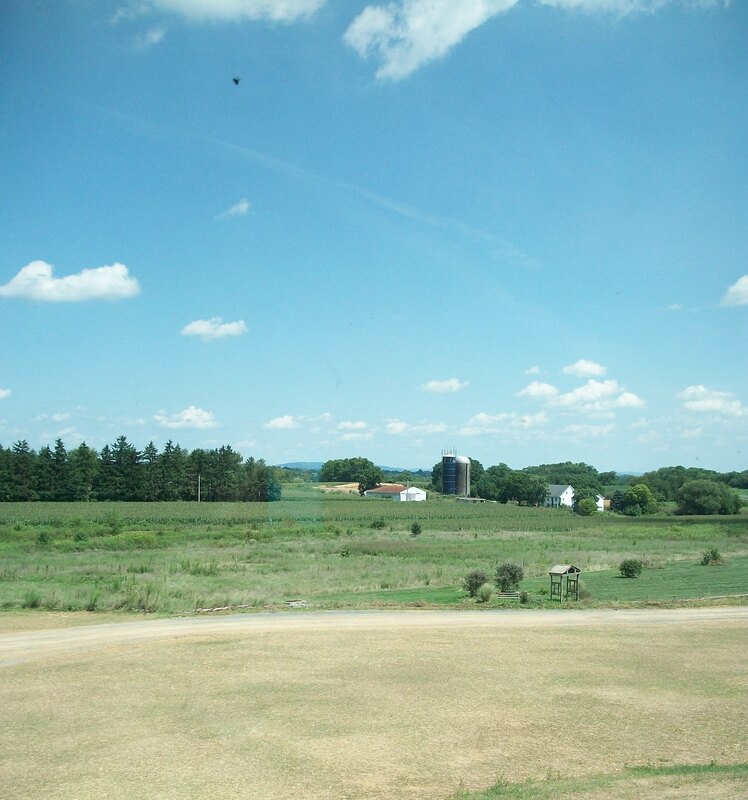 It seems fitting to teach in Lancaster County and to be able to turn around and see barns and silos and corn. That’s for today. But, sometimes I let my mind wander. I can’t even imagine what God might have in store for those fields someday. I think back to when I was a student less than 10 years ago at the school. Some students started a joke circulating on an email chain, and as the replies started to mount, the entire student body was told to cease and desist before we crashed the email servers. To see computer classrooms and document cams and have an email inbox with over 500 messages makes it nearly unfathomable for me to think about what the next 10 years could possibly hold. This entry was posted in teaching and tagged gratitude, SLC, teaching. Bookmark the permalink.